Having a hard time texting to so many friends? Well now there is a solution, GroupMe. 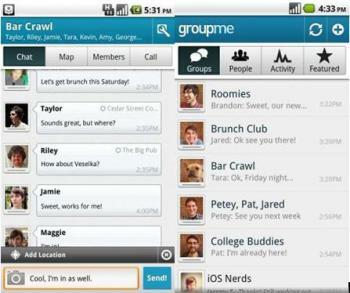 This app enables you to send the same message to all of your friends in a group, just like a chat application. Basically it makes it easy and effective for people to SMS with a group of people. Launch the application and search your contacts for the people you wish to be in the group. Create the group and then you are assigned a number. This number can be used to send messages to, and all the people in that group will receive them, and be able to reply to it. The best part, it also creates a conference call between all of your friends in that group on the same number. Making the groups doesn’t charge you anything and the app is available at the Android Market. Also there is a beta version available for Blackberry owners. This is a killer app and would be very useful for conferencing.